There’s a part of a Presbyterian church service popularly known as ‘the collection’. 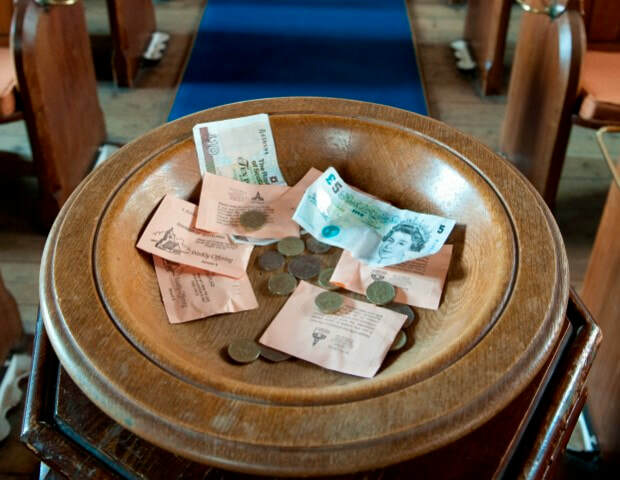 The Minister says, ‘Your offerings will now be received’ and a number of ‘collectors’ pass wooden plates or baskets around the congregation for donations of money to support ‘the Lord’s work’ locally and further afield. I remember when we were children Mum checking on a Sunday had we got our coin safely in our pocket for the ‘collection’. Later as a young person I used to think it felt a bit like a commercial break accompanied by announcements, an opportunity to shift position in the hard wooden pew, chat to the folk sitting beside you and maybe share a sweetie or two. But here’s a question : What’s the difference between an ‘offering’ and a ‘collection’? Allow me to illustrate. A young man invites his beloved for dinner. He cleans the house, cooks her favourite tasty meal, decorates the table with flowers and candles, puts on his best shirt and aftershave, even chooses nice background music. You get the picture. That is an offering. Later on he scrapes the dishes and leaves the remains out for the neighbour’s cat or whatever else is nosing round the yard. That is a collection. Is what we give to God a beautiful gift of devotion, or the leftovers? It’s Easter season again when we focus on the cross and reflect that God so loved the world he gave nothing less than His precious only begotten Son to suffer and die that we might not ‘perish’ but have eternal life. Jesus knowingly offered Himself as a pure, sinless sacrifice to atone for our sin and mess. What shall we offer in return? The scraps of our lives, the remaining brief moments and pennies after all we’ve spent in indulging ourselves? That were(would be) an offering far too small.